Photos and diagrams by Bill Becwar. To Install a truck in a Corgi car may be difficult, but It isn't brain surgery, exactly, just a little fabrication and layout. Note that much of the non-model stuff is straight from the hardware store. 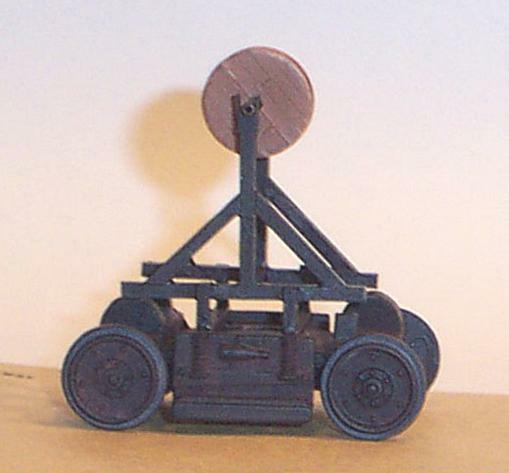 The 4-40 threaded rod and T-nuts are easiest to find in the model airplane section of the Hobbytown hobby shop. The first challenge is how to get the Corgi apart without damaging anything important. 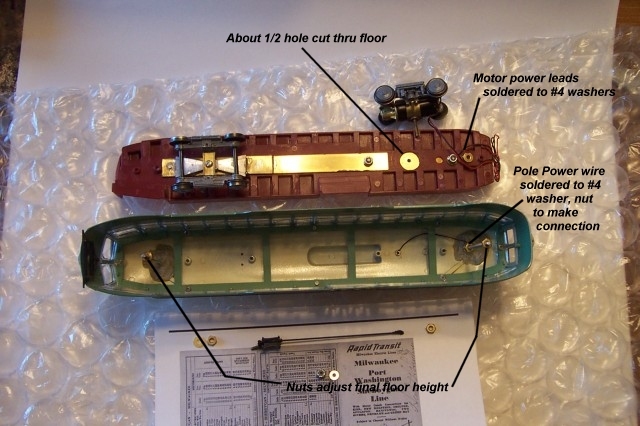 The trucks come off with screws (see photo #1 ), but the bottom won't seem to come apart for anything. The floor is actually two pieces, the outer, bottom piece and the inner seats and interior details piece. We have to remove the outer piece first. The trick here is to look in the windows; the four mounting studs from the car roof are permanently press fit into plastic bosses in the lower floor. They will not pull out, but you can get around this by hand drilling into the bottom floor right under each of the bosses with a good sized drill (say 1/4")(see photo #2 ). You can almost see little depressions in the metal where the thicker plastic at those spots shrink a tiny amount extra when cooling. The object is not to drill through the floor, but to weaken the outer floor right at those mountings. Editors Note: We have prepared a template that can be run on a printer. It will align the location of the mounting stubs. You can then use a Dremel tool with a fine cutting mill to cut around the post. It will leave a small 3/16" hole. 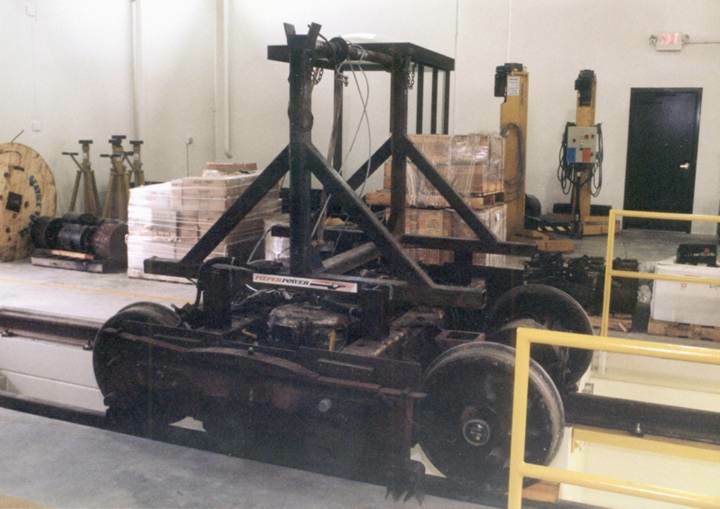 Two can be used for extension posts to remount the floor, one will be eliminated when the motor truck hole is cut so it can be ignored, and the one to the rear of the car can be filled or capped. To view a copy of the template CLICK HERE. To download a copy of the template CLICK HERE. Keep in mind some printers will distort this image. If the steps do not line up, adjust the size before printing a second copy using your computers "Page Setup". Some printers will truncate the image up to a half inch. We have included dimensions if you do not want to print the template. I didn't have much trouble getting the floor loose by just bending the floor panel a tiny bit to clear the headlight and retriever stud - at least until I file that small slot at the back seat for easier assembly when everything is attached. I was worried that popping the retriever out might damage the paint. One way to remove the headlight without damage is to open the car first, then use a needle nose pliers to start to turn the screw out from inside the car. The entire headlight and screw assembly will usually come out in one piece. 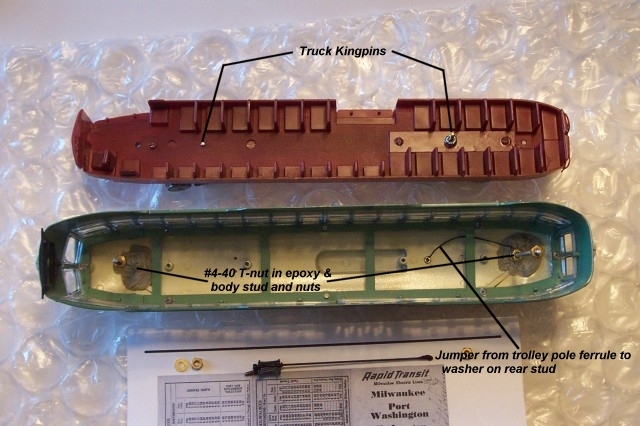 Now with a small screwdriver (and some thin wood or plastic to protect the body paint), pry up on the outside floor pan to pop each of the bosses off in turn(see photo #3 ). Once they are clear everything comes apart pretty easily, though you may have to gently bend the floor a bit to get it clear. You can then take a pliers and (carefully) break off the four Corgi mounting studs at the inside roof - we won't be using those. 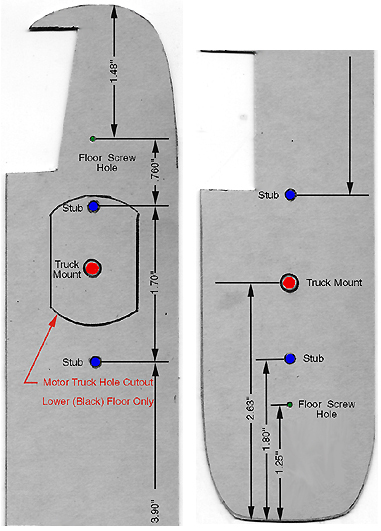 Mark each truck center location by drilling a small hole in the inner floor (with the seats). This will provide a reference point for later work. Throw the outer floor away, mufflers, tailpipe and all. Now you have a nice car body and a detailed inner floor - except that the floor is too thin and too flexible to support the trucks properly. 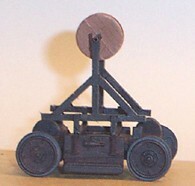 I use strip brass to make a reinforcing frame for the truck mounts. 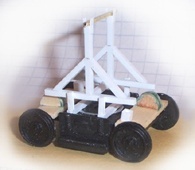 This also allows having the trucks at near prototype height. First step is to file off any protrusions on the plastic floor that will get in the way of either truck swing or the brass truck frame (see photo #4). Leave the raised round hole in on the plastic floor for the front body mounting stud - handy to have that insulated. For ease of assembly, file a notch in the very back of the rear seat to clear the mounting stud for the trolley retriever on the back of the car. A little thing, but it saves cussing later. While we will be mounting the floor to two studs connected to the roof of the car, note that it is really the plastic window material that holds up the floor, so the studs just allow you to pick up the car without the chassis falling off. That would be just a little too non-prototypical. Note that the brass strip is split into two sections with a long part under the front of the car and a shorter section on top of the plastic floor right in the rear aisle between the seats (see photo #4 ) & (see photo #5). The rear power truck actually mounts to this brass strip, allowing a prototype floor height (mounting under the plastic floor makes the car too high). See the truck mount drawing, which is as close as I get to having a written design for this thing. I pretty much cut 'em to fit, using the holes already in the floor for the mounting screws. 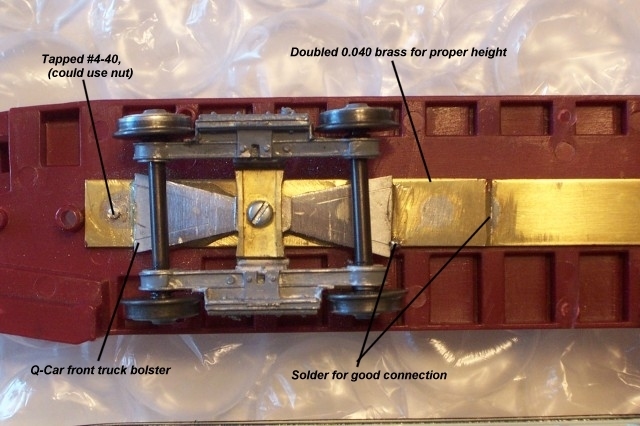 When you have your pieces fabricated, check assembly and then epoxy the three front truck frame pieces together (see photo #7) & (see photo #8 ) show the two brass strips and the Q-Car bolster assembled). Make sure the rear mount holds the truck in the right spot, then expand the hole in the plastic floor to something around 1/2" (photo #9) - about the width of the aisle. The brass will cover this from above. You can paint the top of the rear brass strip to hide it inside the car. Time for the body mounts. I copy the Corgi design to the extent of using studs inside the car - just move them out of the way and make the body removable. Easiest way I've found to put this together is with epoxy putty and T-nuts (which are actually meant for wood). Make the studs longer than you will need and cut them down later. Place the carbody upside down and support it so it is level (I like to use bubble wrap for this). 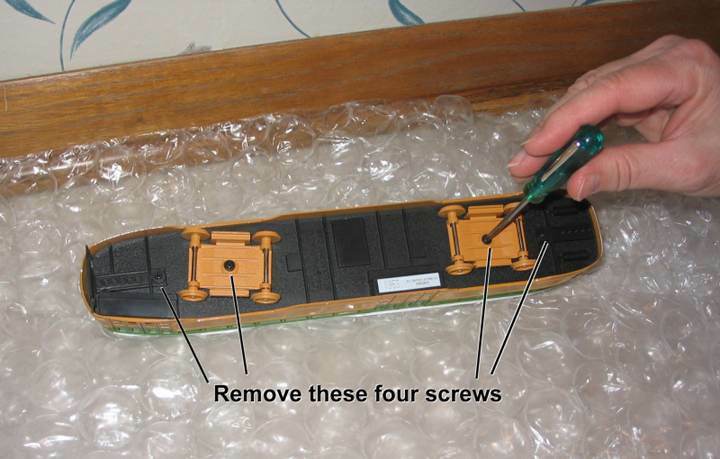 Drill holes in a couple of popsicle sticks and temporarily mount them on the bottom of the plastic floor to other than the furthest hole forward and furthest hole back - the locations of the carbody mounting studs (see photo #4). 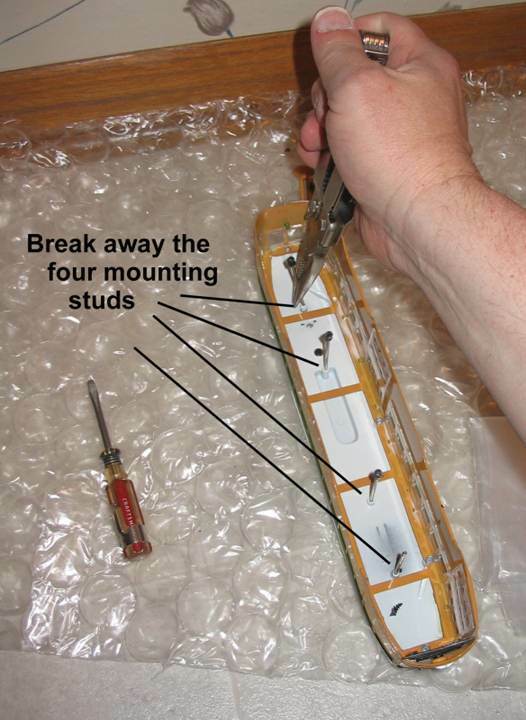 Screw a T-nut onto the end of each stud and epoxy the T-nut to the roof in approximately the right locations. Slip the plastic floor onto the studs and use the extra stud length to align the exact location of the T-nut inside the car so the studs are straight up and down - mostly for a nice appearance, actually. While the epoxy is curing, solder the truck power lead wires to the outer edges of the brass washers. If you will be using overhead, you can also make the 1/4" long brass ferrule out of 1/8" brass tubing and solder a wire between that brass tube and a #4 brass washer (see photo #9). 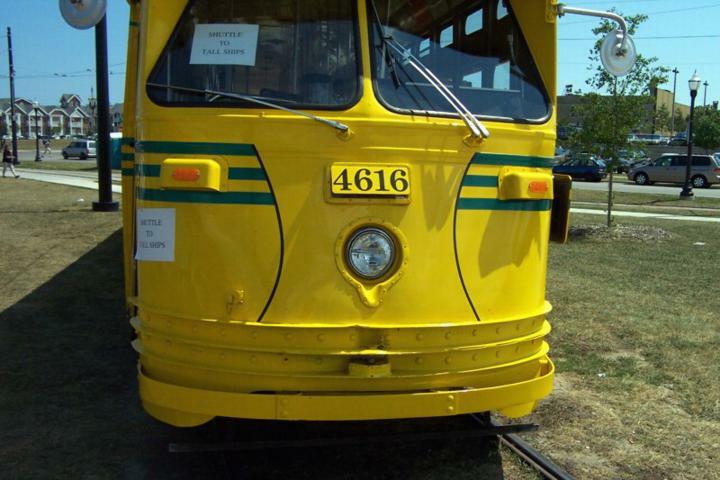 You may have to drill out the tubing slightly for clearance of the trolley pole's 2-56 screw. I have always put the screw in from the top (or used a bit of threaded rod) on my poles so that I can take poles right off for packing the car away. Keeps the poles from getting bent or scratching the paint. This also allows immediate change out of a troublesome pole without opening the car up and playing with the wiring. 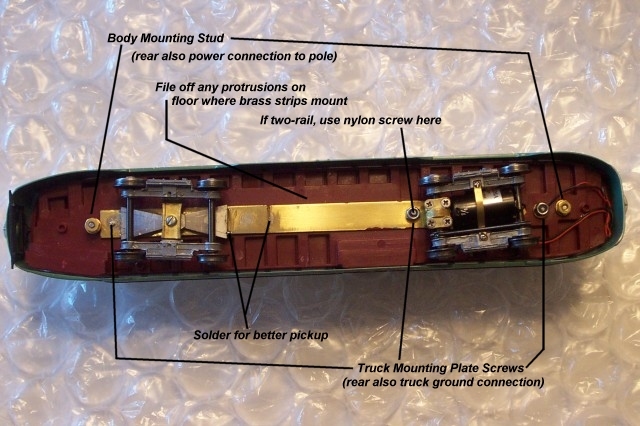 While you have the soldering iron hot, make a nice connection between the Q-Car bolster and the brass strips to make sure that the front truck power pickup will work reliably. 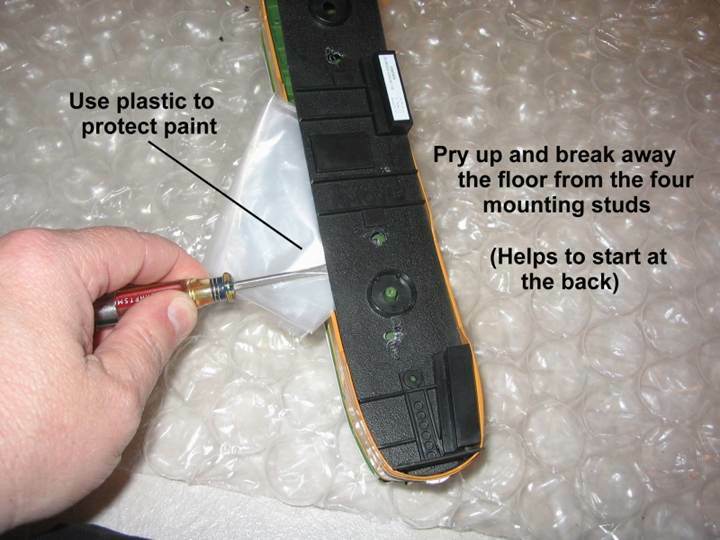 Once the epoxy has set, remove the plastic floor and assemble the parts . If you use two-rail power, you can connect everything at this time, with one power lead going to the nylon screw in front of the rear truck and the other to the mounting screw behind the rear truck. 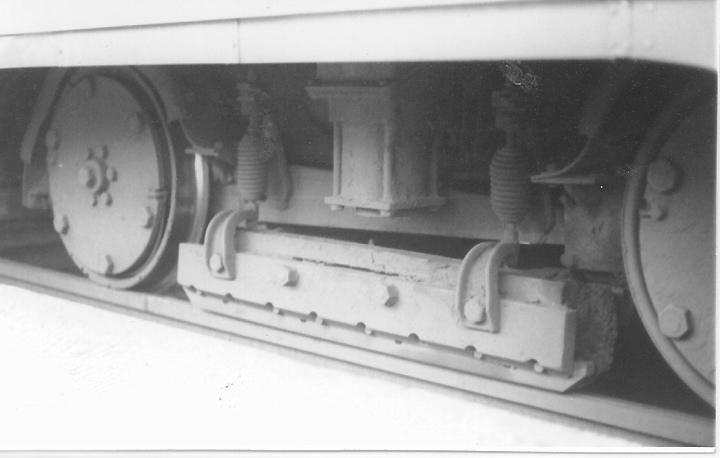 Remember to check which side the insulated wheels are on - they have to be opposite each other for the two-rail power to work. The bare chassis will actually run, at this point. For testing, I'll sometimes use a nine volt transistor radio battery, which has just enough oomph to power the car slowly. This allows you to be sure the car runs in the right direction with positive power to the red motor wire. If using overhead power, the positive (red) wire will be loose for the moment. 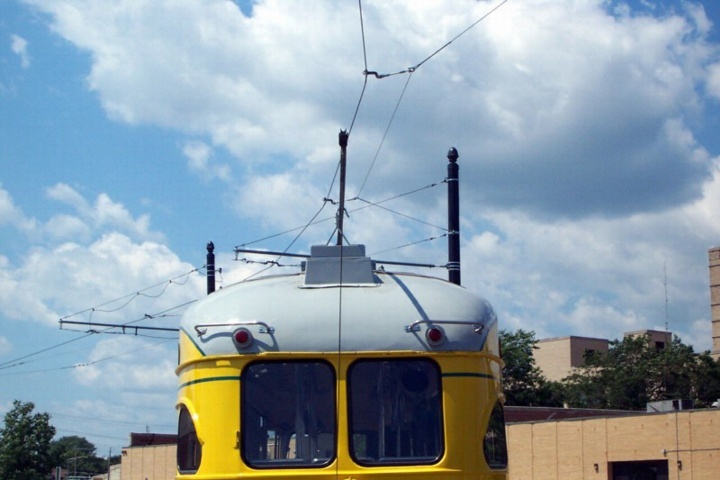 This part of the design allows you to convert a car from overhead to two-rail as needed. You can paint the top of the rear brass strip in the carbody at this point to hide it better inside the car. Put the floor assembly on the studs (helps to start from the front) and mark the length to cut the body studs with the floor down all the way. You should be able to unscrew the threaded studs from the epoxied-in T-nuts. While the studs are out of the car body, modify the body by removing the fake plastic trolley pole and filing off that metal thing just behind hole for the trolley pole. Drill out the hole in the fake trolley pole mount cast into the car roof for a press fit of the 1/8" ferrule and glue it in place with a little CA from the inside. It helps to have the brass just a tiny fraction above the car roof, so the pole rides on a brass bearing/contact surface. 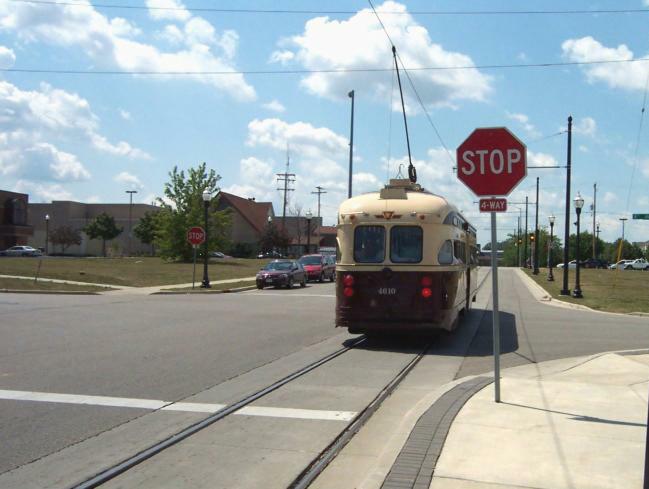 Note that there is no insulator on the brass trolley pole ferrule, so the cast aluminum car body will be hot to the positive overhead wire. I used to worry about stuff like that before I got the Zen nature. Took a surprisingly long time before I figured out that 12 volts is just not a problem for our plastic passengers. Also that the car runs just fine this way since the plastic floor insulates everything nicely. If a truck comes in contact to short against the carbody, far more things are wrong than an electrical fault. 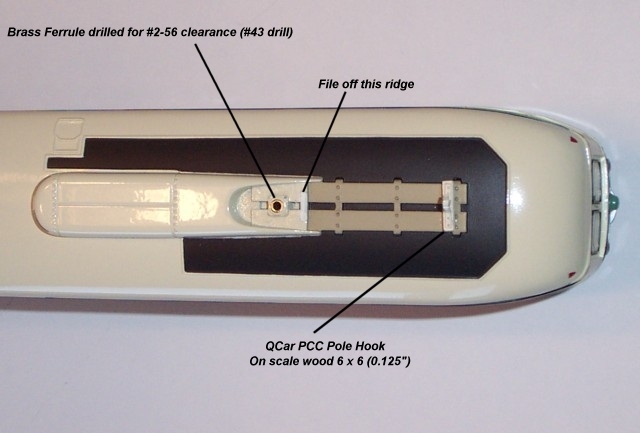 You can add the trolley hook to the carbody now, too, just be careful not to knock it off while doing final assembly (see photo #10) shows modifications to the top of the car). With the modifications done, turn the body over, screw in the cut-to-length studs (remembering to put the trolley pole wire washer in place before screwing in the rear stud. You'll cuss if you don't. Put a nut all the way down on the rear stud over the washer on the trolley pole wire. Then put two nuts on the studs at the approximate floor height and put the floor into place. 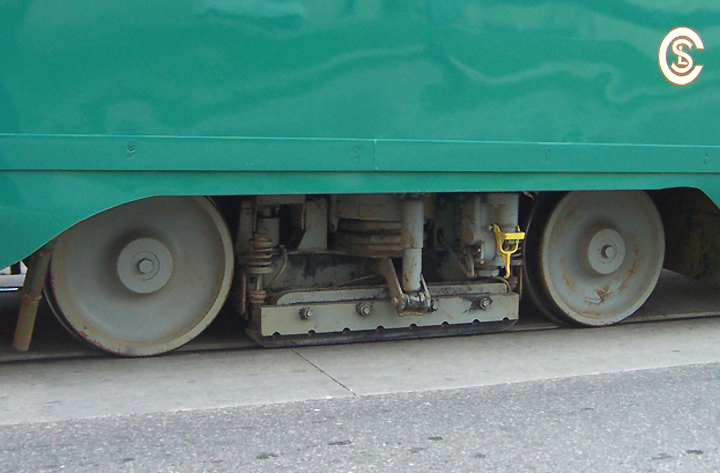 The wheels should just (barely) clear the carbody cutouts when the trucks are level. Trust me, the trucks will never be turned out that far in even the tightest turn - mine will do a scale 30' city corner on streetcar trackage without hitting - the wheel wells are actually not at all necessary for turns. Did you know that some of the prototype PCC's in Chicago lacked any type of wheel well cutout at all? Mechanics complained that they were hard to service, and those cars had a problem with overheated traction motors, too. I never saw these on the street, but the models I've seen running have a weird fascination - kind of like they are just floating down the street since you never see a turning wheel. When the floor height seems right, thread nuts onto the body studs with the positive (red) motor lead on the rear stud, put on the pole, and you have an assembled car ready for its break in run. Once I'm sure of the placement of everything, I will put a little dab of flexible glue (like a rubber cement) on the motor leads at both the motor and the car body to keep the soldered connections from getting any stress or motion. Just remember to leave enough slack to allow the motor truck to turn freely. The really ambitious can drill out the headlight and fake "lump" taillights and provide the car with working lighting. To do this, I have cut down the lifeguard a little, then used a styrene spacer on the front of the floor section to hold it in proper alignment (larger shims are necessary because of the cast-in step). The lighted car does look pretty cool, though it will take me a while to work up to building the proper double taillights. As an expedient, I used a AAA battery in a Radio Shack holder and a miniature slide switch for head and taillight power on my Johnstown car - there is just room for that to hide behind the skirting. Works OK until I can design a proper regulator... Coolest thing is that the car sits there with the lights on full while at a stop. Why this design? It is relatively simple to build, uses as much of the original Corgi as is workable, and uses mostly simple, easy to find parts. And no advanced tools required - a simple hand drill and reasonably fine saw and a couple of files will do nicely. Also, the wiring is set up so that all of the wire that moves can be inspected and repaired immediately. Nothing moves inside the car body, so there are no connections to break. Power pickup is from as many wheels as possible, whether using two-rail or overhead, which can be converted easily without any rewiring. Removing two nuts gets you inside the car, and the floor/chassis can be completely removed for servicing or cleaning. With a minor amount of planning, the drives could even be exchanged between cars (I sure wish I'd thought of that earlier before I did two incompatible cars!). This, plus the solid design of the Q-Car trucks, makes for a sweet-running car that puts on lots of (real) miles between shop visits. The only regular servicing for these cars is inspection of the front truck to be sure the screw is tight enough (but not too tight) and a drop or two of LaBelle oil. These cars are exceptionally heavy for a running model, which allows them to track very well when operating at anything like prototype speeds. Looks like a lot of steps just at a glance, but they are pretty straightforward and it mostly amount to five or six saw cuts, just over half a dozen drilled holes and a little filing - just about one evening's work, I think. And when they are done and running, I love to watch the "pole dance" as the cars thread through that nice S-turn in the special work. 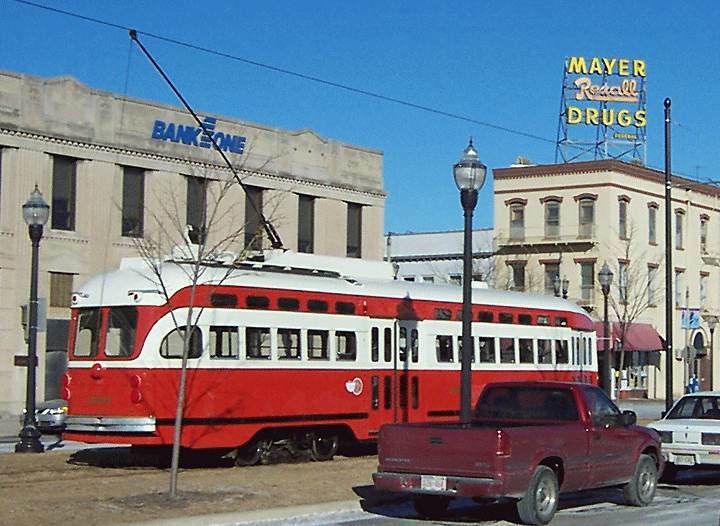 I am fairly new to trolley modelling myself, having wandered into it in the late 1990s - mostly on the strength of what was happening in my old hometown of Kenosha. I knew most of the players who got the thing going, and the history of everything around the line. After five years, their downtown is looking healthier - an amazing number of factory-worker liquid lunch joints have become wine bars! And the Corgis are always a big hit in Kenosha, with our most memorable operation being the three times we've set up inside the actual carbarn (1:48 scale on the left, 1:1 scale on the right). Of course, now I always have more projects than time, which is why a nice little job like this has such appeal. These cars are nice looking, relatively inexpensive, good running and practically indestructible. They stand up against far more expensive models pretty well, and are a great way into the hobby without going broke. 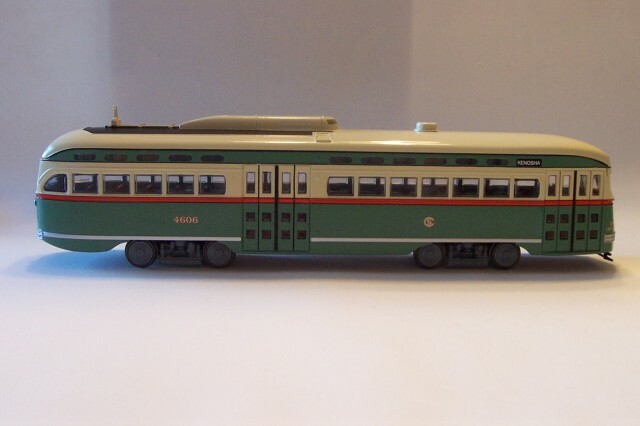 At around $160 for a running car, nothing in O-Scale comes close. Click on the thumbnail to see the full size photo. See text above for explanation of each photo. The original Toronto cars had Clark B2B's, but they were an experimental failure. After that, the cars were re-trucked with standard Toronto B2's, but those stayed in Canada when the cars headed south to Kenosha - the 4' 10-7/8th gauge was rightly considered silly. 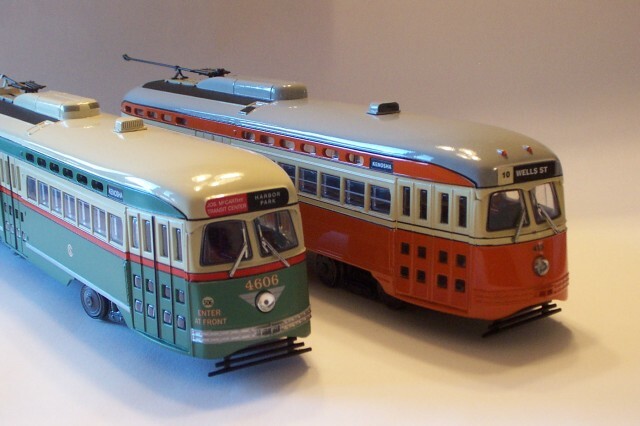 The K-cars now have the reworked that came from CTA 6000s - ex-Chicago PCC streetcar trucks remanufactured by St. Louis Car (sure look like St. Louis transit B3's, complete with third rail bracket mounts). So, to get really purist, we really ought to use the CTA 1-50/6000s B3's with the third rail beams removed. Kenosha's B3's don't have composite wheels, though they may get them over the next few years - I was just talking to their transit director last Monday on this, and he has that as a future budget item. It's also part of their expansion plan - where they run today, the whiny wheels don't cause any problem (the Metra commuter rail station, the Court House, Civic Center offices and the park and museum are the only neighbors close to the turns - good design). But if the expansion plans they have running play out, the cars will be grinding through residential neighborhoods just southwest of downtown, so composite wheels have to be part of the future plan. I think they might have to do a little gauge work on the Chicago car, as well. In the tighter turns, it has that distinctive vibration that comes of binding. I didn't check underneath for any wheel wear pattern, but it is the only car doing that little dance. We now have three different trucks at different times and two possible wheel combinations in now and some day later setups. Sure helps that the trucks are hard to see on a PCC, even at the best of times. Also an assist from Kenosha is that all the cars save Chicago feature shiny black trucks - darned things just disappear, and in the hundred of pictures I've taken of these cars, I have about 5 that even show the wheels. The Chicago car's gray trucks are the only ones to see for the best detail photos. Those yellow spring clips on the suspension seem to be new - and installed on all the cars after the 2004-5 winter. One additional feature the serious purist could model is the CTA-style, truck-mounted snow plow they attach every fall to most of the cars. It is just a small, angle iron pilot beam on the front truck - and roughly triangular in plan view, sort of like a four-inch high wedge plow. They are only good for a couple of inches of snow, but they do the job for the most part, with the diesel plow only being called out a few times a year. The lightweights are OK to knock the "fender burgs" out of the way. Kenosha's B3s are certainly a unique product of where they have been all these years. 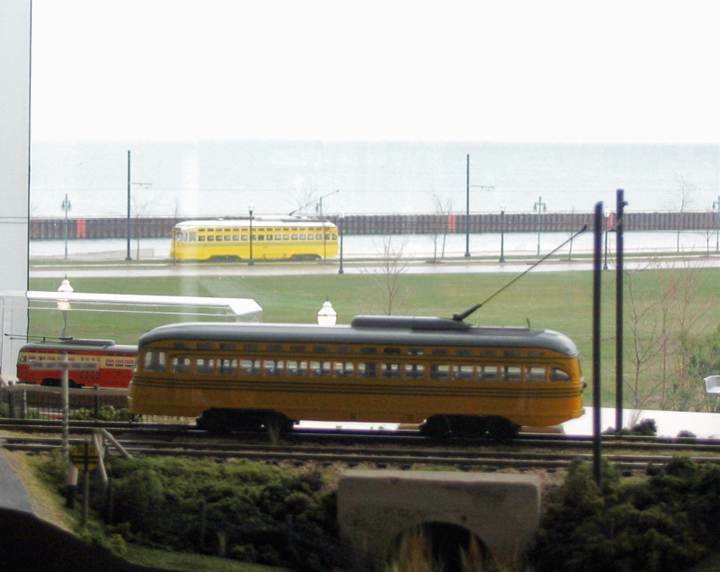 The scrap CTA trucks were a cheap and practical way to get the PCCs running fast on standard gauge track - which Kenosha was smart enough to adopt. (Unlike Detroit, for example, which paid the price in maintenance costs for their cheaply built "special" trackwork.) 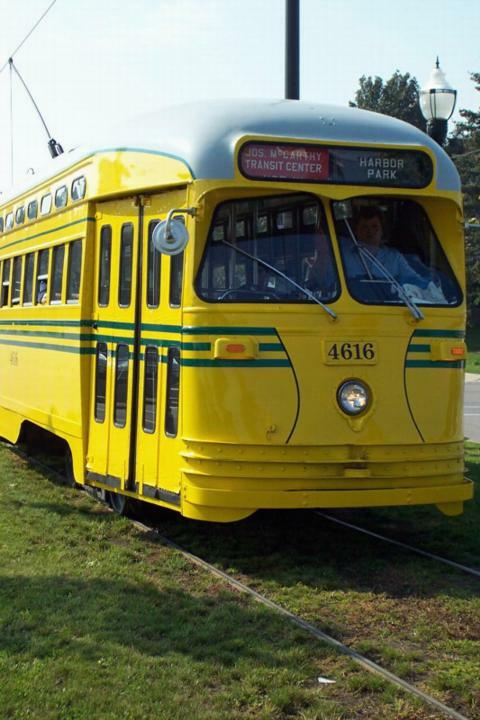 As painted and ready for use, the five Toronto cars averaged about $65,000 each; far less than a halfway decent used bus. 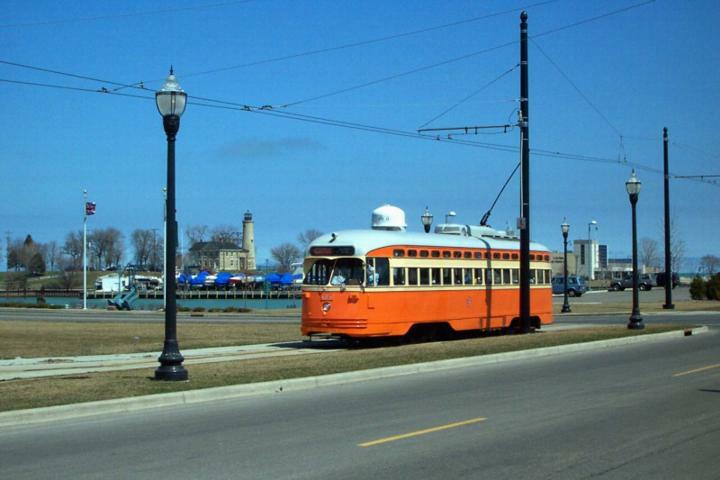 And while there have been occasional rumblings about Kenosha looking to pick up a "tourist car," the PCCs have been a pretty good bargain and have done good business. And now the city is looking to promote itself for filming movies or TV shows, etc. I expect a 1940's or 50's movie setting could use that stretch along 56th Street with its well-maintained and relatively unchanged 1920s era buildings, including a high school, museum, court house and post office all surrounding a block-square park. It would be no trick at all to make that be Philadelphia, Boston, Baltimore or any of the other "streetcar cities" of the era. Incidentally, the Lakeside players, whose theater is on the streetcar loop, are finally doing "A Streetcar Named Desire." I hope they do the live sound effects! 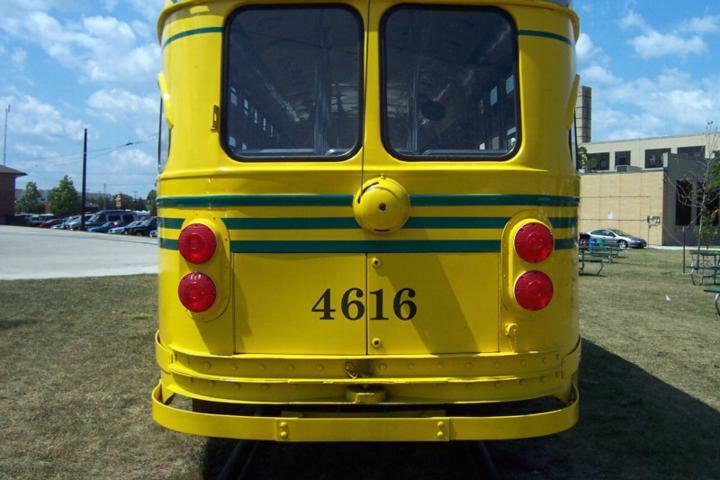 To help sort out the confusion is the photo of the rear truck of Kenosha PCC car #4609 in service, along with the rarely photographed "Car 6" - one of the spare PCC trucks just as it came from CTA but with an added cable reel attachment. This was used in wiring the line in 2000, and is used today whenever they want to pull something around to clear flanges or check clearances. Note that they never even bothered to remove all the third rail rigging from that one (Third rail streetcars!? Boggles the mind!). Kenosha has a retired mini snowplow that was once used for clearing alleys - fitted with guide wheels it makes a rather neat snowplow and light middle weight Trackmobile. They tow the cable car behind this when needed, and keep it to rescue any stranded streetcars - happened once last fall when they popped a span wire, possibly because the boat folks yanked the overhead dragging one of their yachts into the marina. This use of surplus trucks and equipment was part of how Kenosha pulled off two miles of track through downtown, 5 refurbished and re-trucked cars and a new, two track carbarn building all for less than $5.5 million. In Kenosha, the money went right into the structure, with deep ballast, concrete ties and all welded 100+ pound rail. You could run boxcars down that streetcar line. This was done for the useful political purpose that it will be decades before the line needs any serious track work. The Corgi's make a very nice representative model, but probably will never be 100% true. 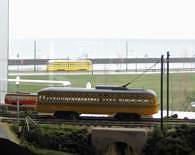 Details lacking include the Kenosha cars dash lights, chromed grab irons and extra tail light (the Kenosha cars have four tail lights). 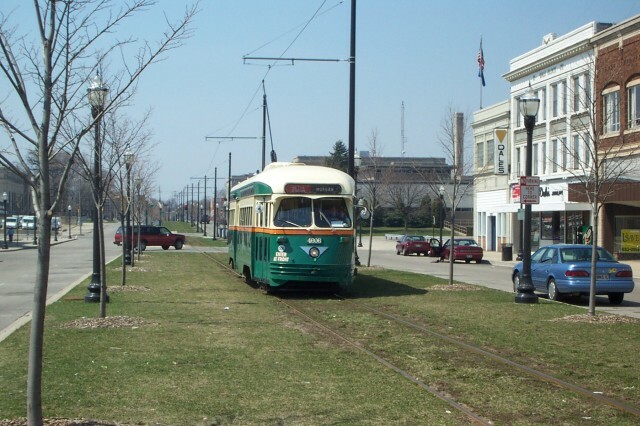 Along with the green express light (missing on two of Kenosha's cars) and the distinctive sheet metal step at the back end of the trolley boards behind the pole hook. But they sure get recognized for what they are supposed to be. 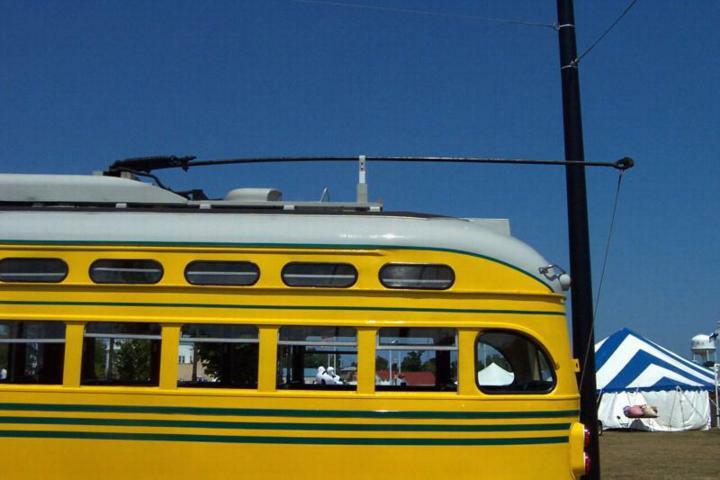 You know how rare that is in with the general public at a show these days, where any streetcar is a just a trolley, whether it be steeplecab, open bench or PCC. Building the Kenosha line they had no traditional line truck nor line car, but the local electricians still lifted the wires to the pre-built supports on one Sunday afternoon. That original PCC reel truck was tossed together just to solve a particular problem they had at the time. The frame is built out of styrene and brass scraps that were laying around the shop. I used a couple of popsicle sticks (!) 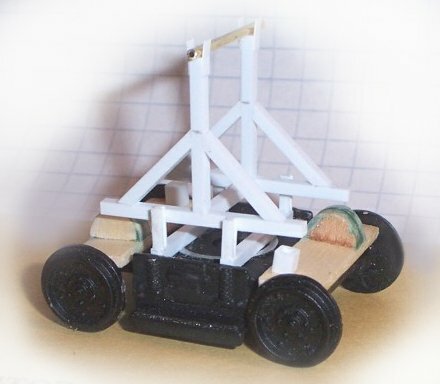 to thicken the Corgi truck to make it look a little less like a tin toy and make a representation of a gearbox. 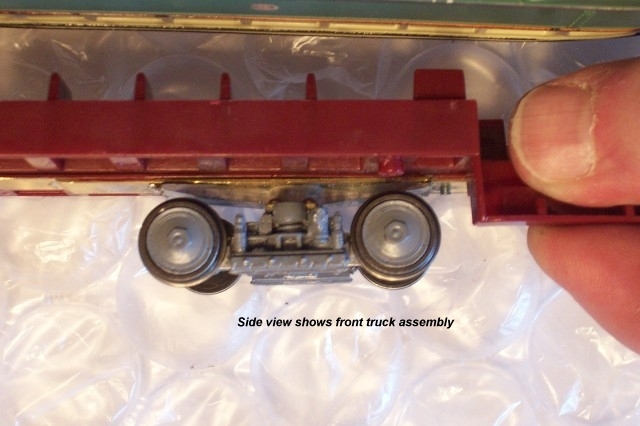 The circular casting on the Corgi truck got the Dremel tool treatment for convenience in mounting the plastic parts. Looks a bit clumsy in this raw state, but as you can see a little engine black and some rusty weathering chalk, along with a cable reel, helped.